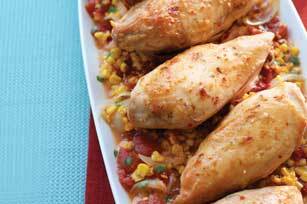 Try out our Zesty Roasted Chicken Breast Recipe at dinnertime tonight! Italian dressing makes this roasted chicken breast recipe so zesty and delicious. Preheat oven to 375ºF. Combine tomatoes, corn, onions and 1/4 cup of the dressing. Pour evenly into two 15x10x1-inch baking pans; spread evenly to cover bottoms of pans. Pour remaining 1/4 cup dressing over chicken in large bowl; toss to coat. Top tomato mixture in each pan with 5 of the chicken breasts. Bake 45 min. or until chicken is cooked through (165ºF). Transfer chicken to serving platter; cover to keep warm. Mix both tomato mixtures in medium bowl. Add cheese and cilantro; stir until well blended. Serve with the chicken. Add 1 tsp. crushed red pepper to the tomato mixture before spreading into baking pans as directed. For easy cleanup, line pans with foil before using.